What makes TuffRail® the BEST cargo management system? TuffRail® is as strong as ANYTHING you can mount it to and because of it's free rotating swivel will not apply undue strain at odd angles when securing a heavy load. TuffRail® is attractive, using a low profile design, and available in bare, black, or custom finishes it will look great on your truck or trailer. TuffRail® is the only adjustable sliding cargo rail made with pride in the USA. TuffRail® is the only cargo rail offered with a limited LIFETIME WARRANTY. The TuffRail® system makes loading and securing cargo -especially motorcycles, ATV's, and awkwardly shaped loads- easier, and faster. Using strong, easy locking TuffPin™ pins the system can be configured using just one hand while settling a heavy load. This is the TuffRail® overhead rail for use in your basement, home gym, commercial gym, garage, or shop for hanging and sliding heavy bags and other heavy objects overhead. What makes TuffRail® the TOP choice for mounting your fitness equipment? TuffRail® allows you to slide your equipment to a stored location when not in use making this ideal for multipurpose rooms or rooms with confined space. TuffRail® can be mounted to almost any ceiling or wall allowing you to bring a powerful workout to the comfort of your own home. TuffRail® locking positions, lengths, and patterns can be custom tailored to fit your needs. TuffRail® is easily adjustable allowing you to target different muscle groups and parts of your body. TuffRail® is made from sleek, durable, attractive extruded aluminum that will never break, they will last forever! 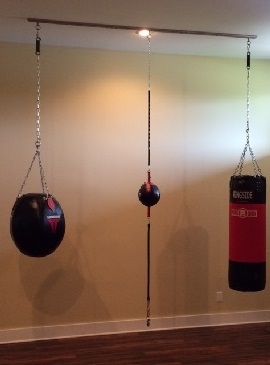 TuffRail® comes with stainless steel TuffPins that can easily support a heavy bag 500+ lbs. TuffRail® works perfectly in commercial gyms freeing up space for a variety of classes. Click on the above video to see how easy TuffRail® is to use for a heavy bag application! 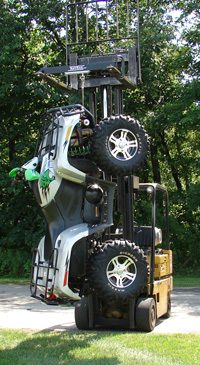 This ATV is hanging from 1 foot of TuffRail® and 1 TuffPin™!